The transition from school to adult life is a winding road that is hard to follow. The links below provide information and resources to assist with successful transition planning in education. Furthermore, courts have held that the IDEA requires schools to prepare Individualized Education Plans (IEP), which confer “meaningful educational benefit” to children with disabilities. The “meaningful educational benefit” requirement includes a focus on raised student expectations, appropriate progress, and transition into postsecondary education and independent living. The IDEA requires that schools conduct “appropriate evaluations “of students who are suspected of having a disability. An appropriate evaluation must be implemented by a team of knowledgeable and trained evaluators, must utilize sound evaluation materials and procedures, and must be administered on a non-discriminatory basis. The Individualized Education Plan was established by the IDEA to help ensure every child’s access to a Free Appropriate Public Education (FAPE). 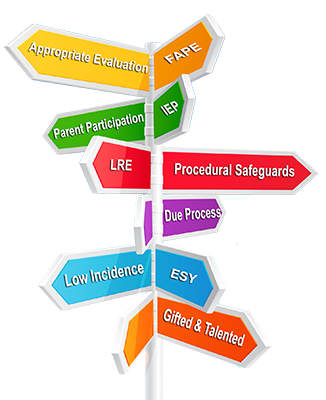 The IEP is a written document, developed by an IEP team, which draws upon existing evaluation information in order to meet a student’s unique educational needs. For more information, visit the IEP Section within the Education Toolkit. The IDEA places a strong emphasis on placement in a general education setting. Under the IDEA, a student is guaranteed placement in the Least Restrictive Environment possible. Therefore, an IEP team must explore a number of alternatives for enabling a student to participate in the general education classroom. These may include: classroom modifications, supplemental aids and services, alternative instructional methods, etc. IDEA establishes procedural safeguards to help parents and students enforce their rights under federal law. The primary purpose of this requirement is twofold: safeguards protect parental access to information pertaining to placement and transition planning; and procedures are put in place to resolve disagreements between parents and schools regarding the placement of a student. A Low Incidence Disability can be defined as a disability that occurs in 1/2 or 1% of the school's population of the students with a disability. The most common low incidence disabilities are autism, visually impaired and hearing impaired students to name a few. Extended School Year services are designed to support a student with a disability as documented under the Individuals with Disabilities Education Act (IDEA) to maintain the academic, social/behavioral, communication, or other skills that they have learned as part of their Individualized Education Program (IEP) or Section 504 accommodation plan. In order for a student to receive ESY services, the student must have evidenced substantial regression and recoupment issues during the previous IEP year and/or there is evidence of emerging skills which are often referred to as "breakthrough" skills. The focus of the services provided to the student as part of an ESY program are generally not upon learning new skills or "catching up" to grade level, but rather to provide practice to maintain previously acquired or learned skills. If a student has received ESY services in previous years the student may not be eligible in future years as determinations for eligibility of ESY services are made annually by the IEP or 504 plan (which includes the parent and student of age 16 or older. NOTE: The mandatory age at which a student must be included varies by State but the Federal law states no later than age 16. In Delaware the age is 14). A hearing process where that parent and district each present their case to an impartial Hearing Officer for a written binding decision on the best outcome for the student. The hope is that the need for filing complaints or participating in hearings will be rare. The best defense against misunderstandings is good information and communication. A child with a disability may also show exceptional intellectual or artistic abilities or be “gifted”. These students are often referred to as Twice Exceptional. Under IDEA a school or district cannot refuse to assess or offer special education services to a child with increased intellectual ability. For more information, see the "Gifted and Talented" section within Education.